8/27/2009 - GOODFELLOW AFB, Texas -- Members of the 316th Training Squadron and the Freedom Through Vigilance Association Heritage Chapter in San Angelo, held a ceremony Friday, honoring an Air Force intelligence NCO to whom Building 519 is named. Lt. Col. Erick Lawson, the 316 TRS commander, and retired Chief Master Sgt. 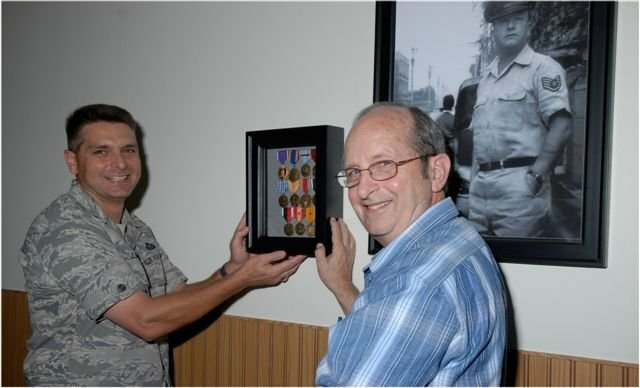 Ed Bendinelli placed a shadow box containing medals belonging to Tech. Sgt. Fred Sebers' on a wall inside Sebers Hall to complete the inside memorial to Sergeant Sebers, who died in Vietnam more than 40 years ago. "We need to make our new intelligence students aware of our intelligence pioneers, those men and women who laid the foundation for what we do today, said Chief Bendinelli, who also serves as the Heritage Chapter vice president. "It's important for them to know and understand the intelligence contributions made by these men and women. They have quite a legacy to live up to." 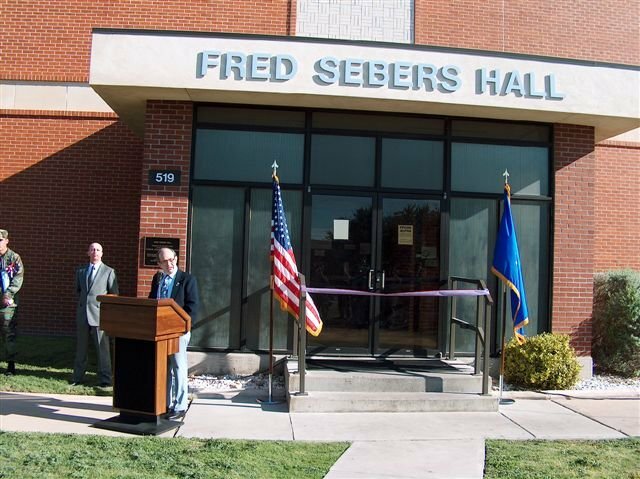 Larry Ross, a retired Air Force senior master sergeant agreed, noting that the accomplishments of enlisted intelligence troops like Sergeant Sebers could not be told for many years due to security considerations. "Now, whenever possible, it's time to tell their story and give them the recognition they have earned," said Mr. Ross, who also serves as secretary/treasurer for the Heritage Chapter. Fred Sebers, an Everett, Wash., native, enlisted in the Navy at age 16 during World War II and manned a 50-caliber machine gun aboard a landing craft in Okinawa. Sergeant Sebers left the Navy after the war, but reenlisted in 1949 for four years before joining the Air Force as a parachute rigger and stunt jumper. After a few "close calls" in his initial Air Force specialty, Sergeant Sebers cross-trained into the intelligence career field in 1959, becoming a communications analyst at Goodfellow. Ironically, his first assignment as a "202" (today's 1N4, Signals Intelligence Analyst speciality) took him back to Okinawa, which was a considerably more tranquil place than when he was there 15 years earlier. Following his Okinawa tour, Sergeant Sebers volunteered for an assignment in Taiwan before returning to Goodfellow in 1964 as a member of the 6948th Security Squadron. 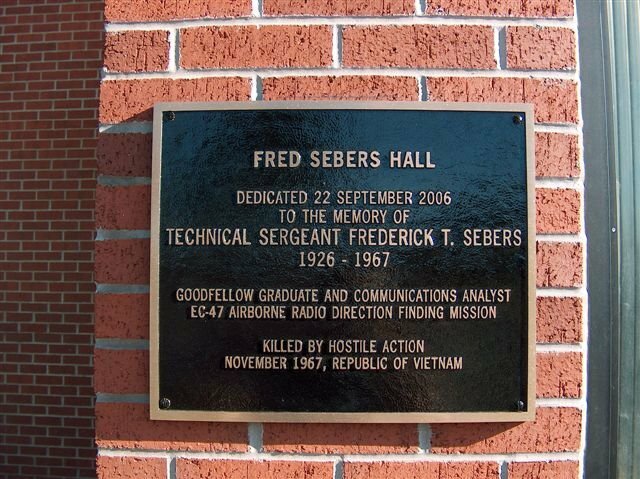 During his assignment to Goodfellow, Sergeant Sebers learned the Air Force had developed a method of conducting radio direction-finding operations from aircraft. Intrigued, Sergeant Sebers volunteered for this new mission, even though it meant going to Vietnam. Arriving in Nha Trang, Republic of Vietnam, in the summer of 1967, Sergeant Sebers spent the next couple of months as an airborne communications analyst with Det. 1, 6994th Security Squadron, flying specially modified EC-47 "Electric Goon" aircraft on the new and highly classified Airborne Radio Direction Finding missions. On the evening of Sept. 8, 1967, he and several friends were dining at the local NCO club when an enemy detonated a claymore mine near his table, mortally wounding Sebers and injuring many others. Sergeant Sebers passed away Nov. 7 of that year, as a result of his wounds, leaving behind a wife (now deceased), a son, and two daughters. Sergeant Sebers' military decorations include a Purple Heart, an Air Medal, a National Defense Service Medal with a bronze service star, a World War II Victory Medal, an Asian-Pacific Campaign Medal, an American Campaign Medal, and an Army of Occupation Medal with Germany clasp. He also earned a Navy Occupation Service Medal, a Navy Good Conduct Medal, an Air Force Good Conduct Medal with three bronze loops, and a Vietnam Service Medal with a bronze service star. Retired Chief Master Sergeant Bendinelli provided a brief history of the ARDF mission to the instructors and students who attended Friday's ceremony and encouraged them not to forget those who gave their lives fulfilling the intelligence analysis mission. "Fred could have easily retired and not gone to Vietnam," the retired chief said. "But he saw this as something he had to do. He said, 'I just couldn't leave with all this going on. I thought I could help.' "I just hope we can instill the same dedication to duty and service to country in the students we have going through training today," he said.